This weekend, I am heading off to a celebration of long-lasting love and commitment. Two dear friends are celebrating their recent marriage after having been together for many years, and this to me makes it all the sweeter. They are dear, caring, private people who have raised a beautiful child, and worked together through many health issues, and it is an honour to be part of their special day of celebration. While they are not a dewy-eyed young couple, racing off to a brand new life together, they have the deeper gleam of the long simmering fire of people who have been through a great deal, and love each other all the more. Although they have asked for no gifts, I wanted to make them a “wee minding”, to mark the occasion. It contains phenylethylamine which is a naturally occurring amino acid that your body secretes when you’re in love. 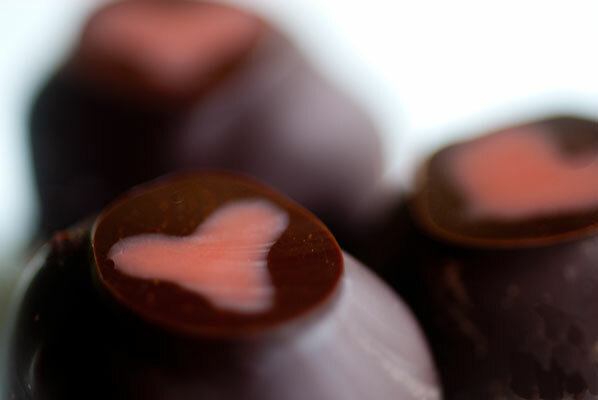 Also containing dopamine and serotonin, chocolate provides natural pain killers that can increase your mood. Although levels of these chemicals can be fairly low and may be most prominent in purer forms of chocolate, their presence has been known to cause euphoria and increased sensitivity making the chocolate experience all the more sensual. Consumed originally as a beverage by the Aztecs and Mayans, it is said Emperor Montezuma II would drink goblets of chocolate before entering his harem for the stimulating and stamina boosting effects it held. Stories regarding Casanova using chocolate to seduce his lovers exist as well. In French history, the Spanish Princess Maria Theresa offered chocolate to her fiancé King Louis XIV as an engagement gift and soon after it became a popular drink in his court. Madame de Pompadour is rumoured to have favoured chocolate as a means to encourage her desire for the king while Madame du Barry, on the other hand, would offer her lovers chocolate to stimulate their energy and excitement. My mother always warned me never to experiment on dinner guests or gifts for friends, and while these two people have well developed senses of humour, and will I know, enjoy whatever my chocolate making efforts bring forth, I am pretty much following my mother’s advice in selection of flavours, but am experimenting just a little in decoration and execution. 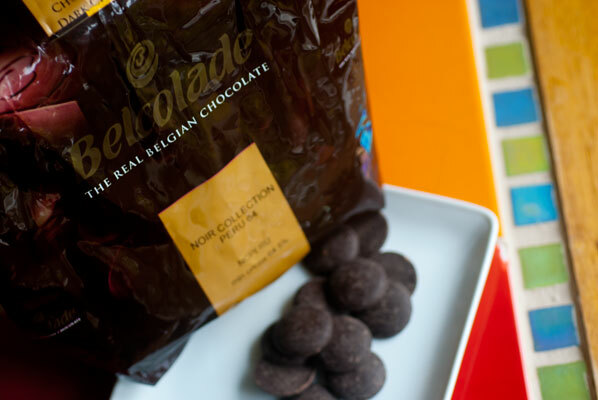 While I was at my favorite gourmet food outlet last week, I picked up two 1 kilogram bags of chocolate couverture pastilles made by Belcolade, a chocolate company with whom I’ve not been familiar. This is one of the wonderful things about Ecole Chocolat: every day is a school day, and a good reason to try new chocolate products. Today, am using their Noir Collection Peru 64. 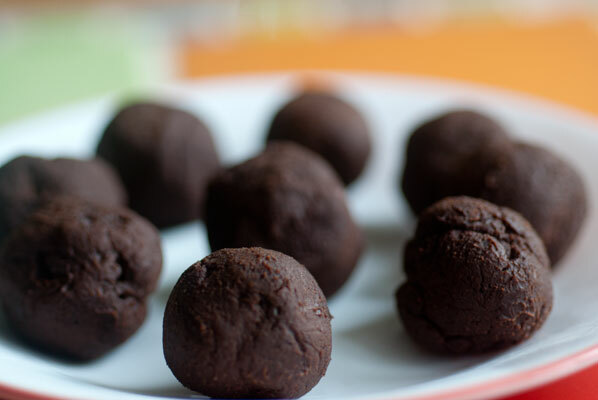 This sounds like a good pairing for both the Saltspring Island blackberry port truffle balls I am making, using David Lebovitz’ recipe for chocolate port truffles, reprinted on Kirsten’s blog, My Kitchen in the Rockies. I am also using this chocolate for the molded exteriors of the lemon white chocolate ganache centres, which are to be the truffles’ companion. I make a simple ganache of 8 ounces good quality white chocolate (Callebaut), melted at 50% power in the microwave until the mass is 70% melted. I added 4 ounces Avalon organic whipping cream, brought to just below the boil, in five additions, constantly stirring. I then added in tiny drops of natural lemon and lime oils. These are very concentrated, and I used a medicine dropper to add them in, until my chief taster (my very patient partner) pronounced the ganache to be” citrusy enough”. I set this aside while preparing the decorations. I temper some cocoa butter (the same procedure and temperatures as for dark chocolate), and colour it with drops of red oil based food colour. 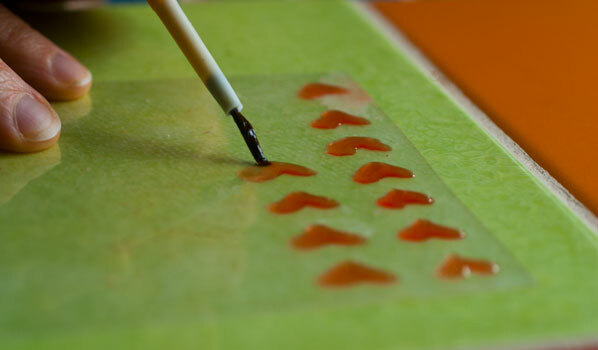 Using a fine paintbrush, I paint free hand heart shapes onto an acetate sheet. These will become my transfer sheets to be placed on top of each truffle, once they have dried, and I have cut them into individual squares. Next, I paint the nooks and crannies of both my heart shaped and sailboat poly-carbonate chocolate molds with the liquid cocoa butter, pour the excess into the cavities, and swish it around in the molds to cover the inside surfaces. 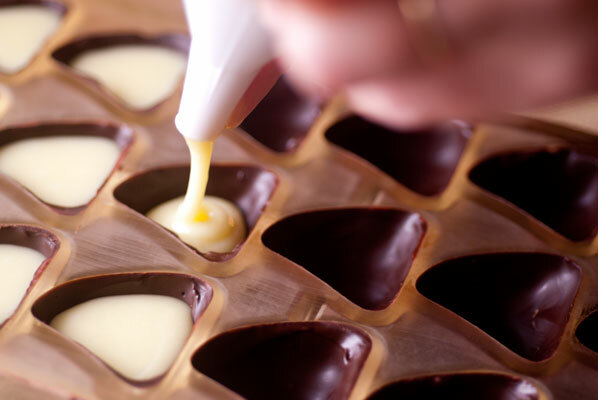 I flip the molds over and tap them to get rid of any air bubbles, then scrape the surface free of any excess, just as you would do when filling a mold with chocolate. Once the cocoa butter has hardened in the molds, I am a bit worried. It looks to me as though the cocoa butter has pooled on the bottoms of the molds, and will obscure the nice thin slick sheen I am hoping for. Oh well, I cannot do anything about this now, and crossing my fingers, fill the molds with tempered chocolate, flip them over to remove the excess, scrape the mold surface clean, and set them aside to harden. Although it is tempting to just cover the port truffles in cocoa powder, I want them to have a thin chocolate shell, so I get out my “cheater”: a thin stainless steel guitar string, strung at a 45 degree angle, across a the top of a right angle (90 degree) aluminium housing, which is tall enough to slide over the corner of the bowl or melter, in which tempered chocolate sits. 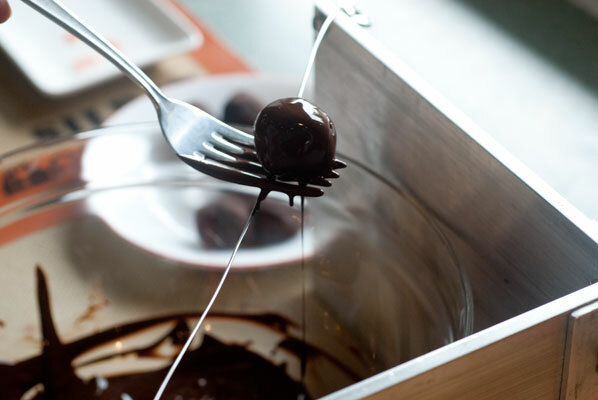 I temper another batch of couverture, and after re-rolling the chilled port truffle balls, to ensure perfect roundness, I dip each one into the chocolate, and after it has been enrobed and slid from the fork, place a square of acetate with a single cocoa butter heart atop each one. 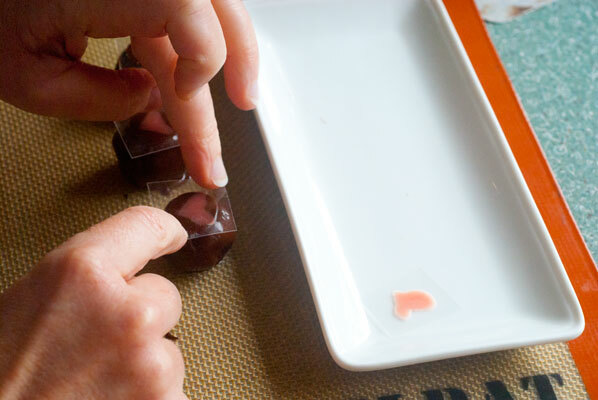 It occurs to me that I am placing something flat on top of something curved, but a fingertip’s worth of pressure on each one seems to do the trick, and because the acetate is firmer than a commercial transfer sheet, it forms a tiny flat surface on the top of the truffle, for the heart to adhere. I am okay with this. 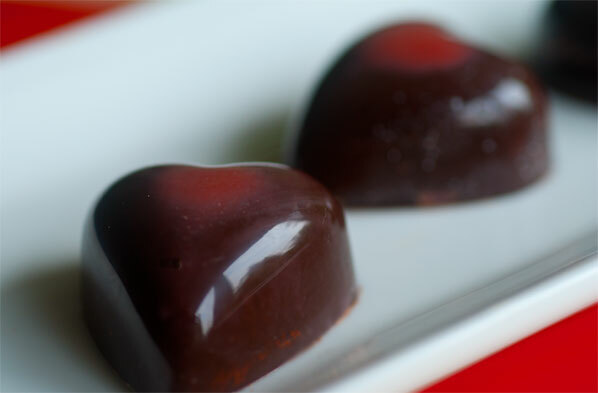 After filling the heart and sailboat molds with the white chocolate ganache, and sealing the backs, I have now only to hope they will release from the molds … and not be too unsightly. The good and surprising news is, that when I flip over the hearts, they slide out beautifully, due to the cocoa butter coating, are slick and shiny, and the best part of all … this unexpected sweet surprise: the excess red cocoa butter, which I feared had pooled into an unsightly mass, has formed a tiny heart on the top of each chocolate. Oh, this is perfect for these two dear friends. Although chocolate may be associated with new love, I think it has a place here too: after all it is deep, dark, complex, a little bitter but ultimately sweet.